In the troubled southern suburbs of Brazzaville, the Congo’s capital city, a resilient group of men have traded arms for Armani. 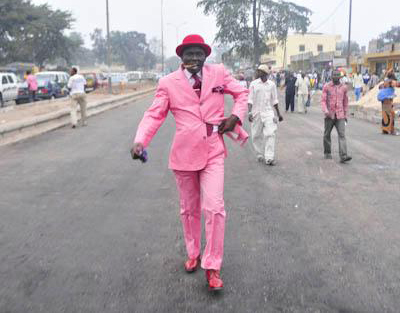 The sapeurs, as captured in Daniele Tamagni & Africolor at Danziger Proejcts through September 10th, are Congolese men who abide by a strict moral code that’s signaled publicly by their equally rigorous dress rules. Tamagni, an Italian photographer working in several African regions, has produced photographs that reveal men in impeccably tailored, brilliantly colored three-piece suits, brandishing canes and cigars in the middle of slum neighborhoods. These men save up for months—often years—for an outfit.